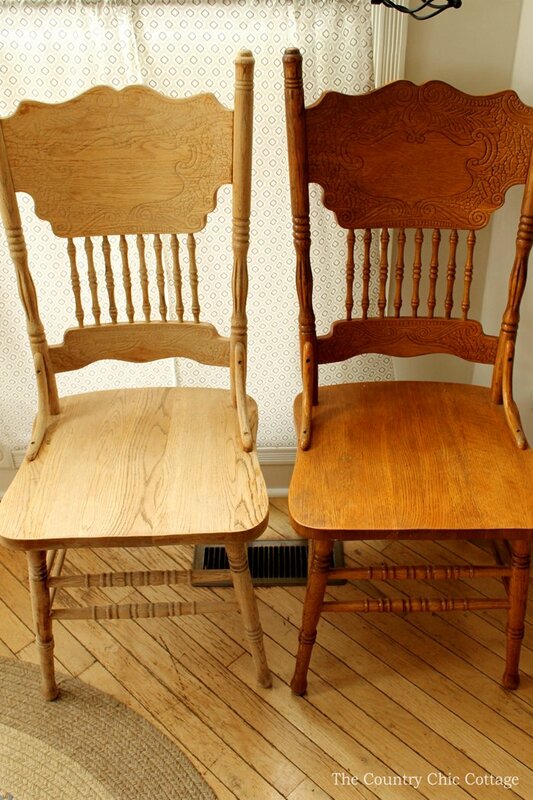 I thought I would share how to refinish wood furniture today. I have been working on a kitchen table for a while now. It is really past time for me to share what I learned during the process with you all. Get the proper supplies and techniques from this post! 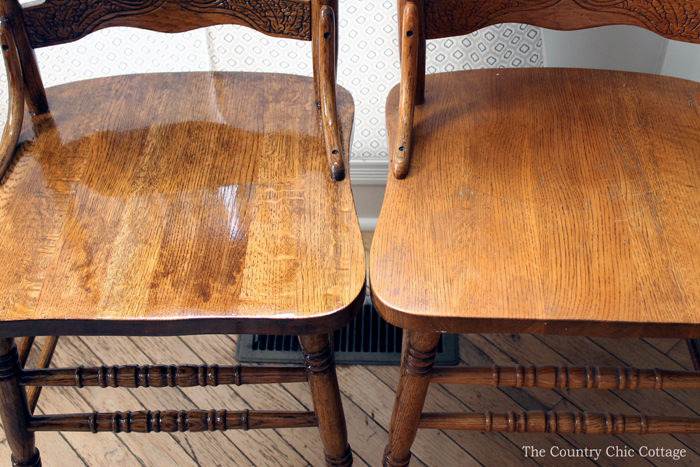 You can stain your own furniture with these techniques! Some links may be affiliate links which means you do not pay anymore but a portion of your purchase will go to support your site. 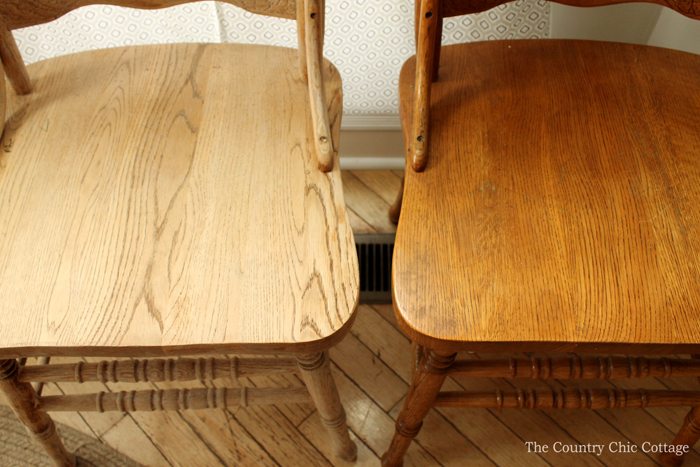 Start by removing the old finish and stain from your furniture. I had the best results with the Citri-Strip Gel. First of all this should be done outside. It is messy. It will kill the grass. But it will be worth it right? Remember to wear protective gloves and clothes that will protect your skin. Spread on thick and leave for an hour or more. I have also seen techniques that say to wrap with plastic wrap but I have not tried them myself. Don’t leave too long or it will dry out too much. I found around an hour worked best for me. Then use your plastic putty knife to start removing most of the gel. Then use your stripper brush in the nooks and crannies and all of those details. This is where you will want to wear protective eye wear. Dip steel wool in mineral spirits and go over the entire surface. The combination will help remove anything that is left on the surface. Then use mineral spirits and a rag to clean up the surface and remove anything that is left. Allow the surface to dry. You will then need to sand the surface. Start with a 150 grit sandpaper and go over the entire surface. Then come back with a 220 grit paper and go over the entire surface. Use a tack cloth at the end to remove all sanding dust and dirt from your surface. You will be left with a very clean surface that is stripped of all finish. Now we need to turn that stripped down surface into something gorgeous! 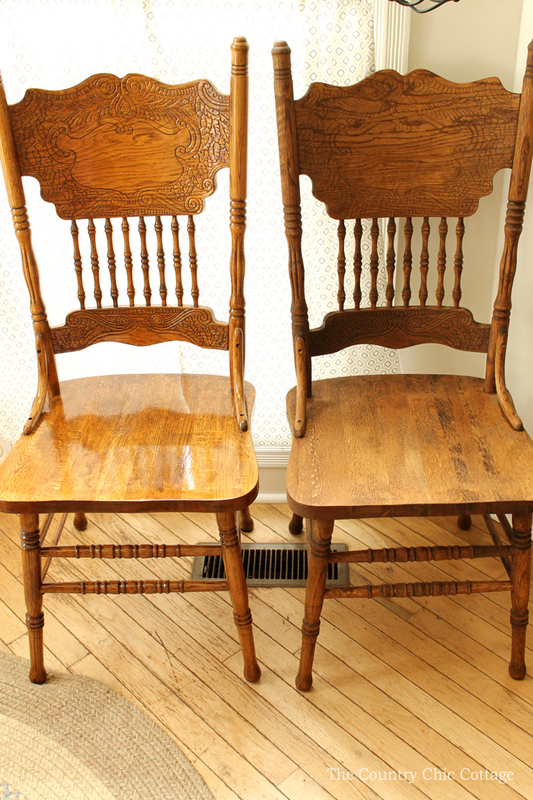 I used the Minwax Stain in English Chestnut on my chairs. Wear protective gloves and spread on your stain with a foam brush. Allow to sit about 5 minutes then rub off with a clean rag. Be sure to apply with the grain of the wood and remove with the rag with the grain. Allow to dry completely. Seriously I do these over several days so I left each one to dry at least over night. You will then need to apply the Minwax Polyurethane in Clear Gloss. I applied 3 to 4 coats to each chair. Use a foam brush and apply with the grain of the wood. Apply in even coats on your entire surface. I did all of my steps outside but you need to make sure you are not working in direct sunlight. That will make bubbles in your finished surface as the coats will not dry evenly. Let each coat dry overnight before adding another coat. Lightly sand with 320 grit sand paper in between coats. Run a tack cloth over the surface to remove any dust before adding the additional coats. Again wear protective gloves as your hands will get REALLY sticky with any that lands on your skin. Once you finish your last coat of poly, your project is complete! Y’all this entire process takes a while but it makes such a huge difference. The more intricate the designs in the wood, the longer this process will take. A simple table with clean lines would be a simple way to start. 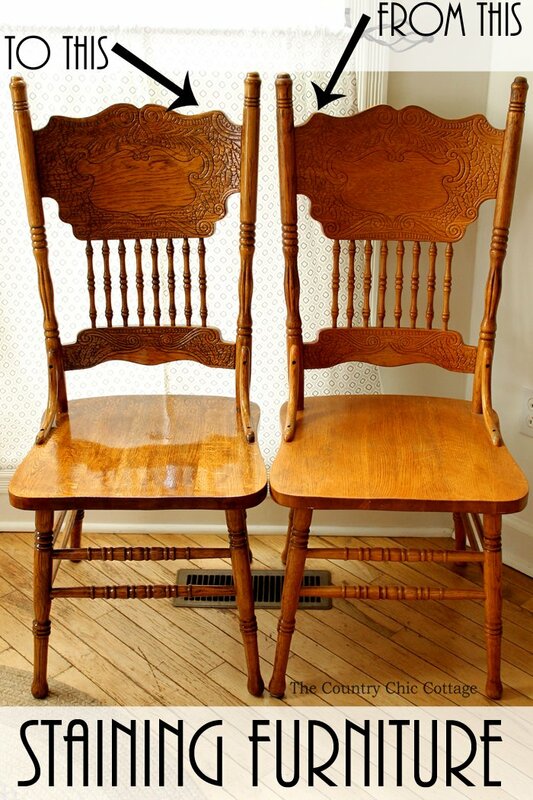 These chairs with all of the detail take a REALLY long time for each one. Either way just dive in and learn how to refinish wood furniture. Turn the furniture in your home into something you absolutely love! 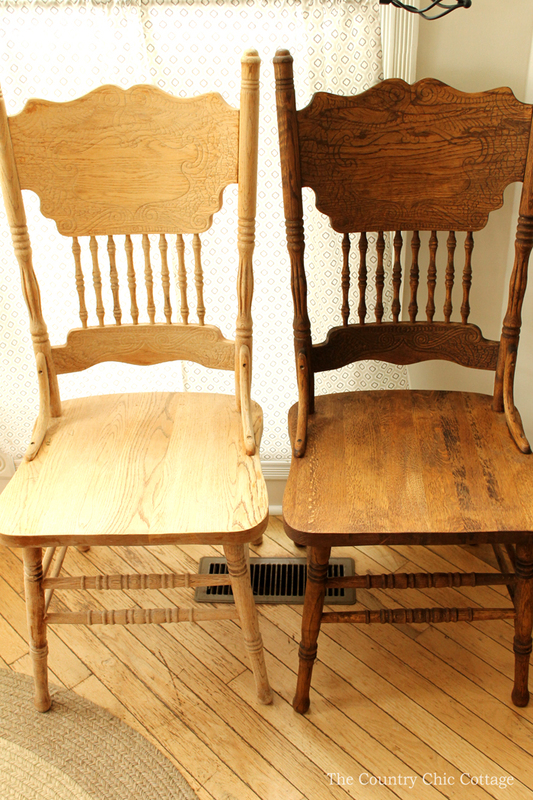 You did such awesome job on your chairs, the chestnut stain is so pretty after the orangey oak. Did you also do your table? You are quite the ambitious young lady. I actually have not gotten to the table! I am going to give the entire thing to my daughter. I think she is going to finish up the table. It is an ambitious project! !